The 1st painting comes from old wm site,and there is a nebula in the center.....2nd comes from internet. Mz 3 (Menzel 3) is a young bipolar planetary nebula in the constellation Norma that is composed of a bright core and four distinct high-velocity outflows that have been named lobes, columns, rays, and chakram. These nebulosities are described as: two spherical bipolar lobes, two outer large filamentary hour-glass shaped columns, two cone shaped rays, and a planar radially expanding, elliptically shaped chakram. Mz 3 is a complex system composed of three nested pairs of bipolar lobes and an equatorial ellipse. Its lobes all share the same axis of symmetry but each have very different morphologies and opening angles. It is an unusual PN in that it is believed, by some researchers, to contain a symbiotic binary at its center. One study suggests that the dense nebular gas at its center may have originated from a source different from that of its extended lobes. 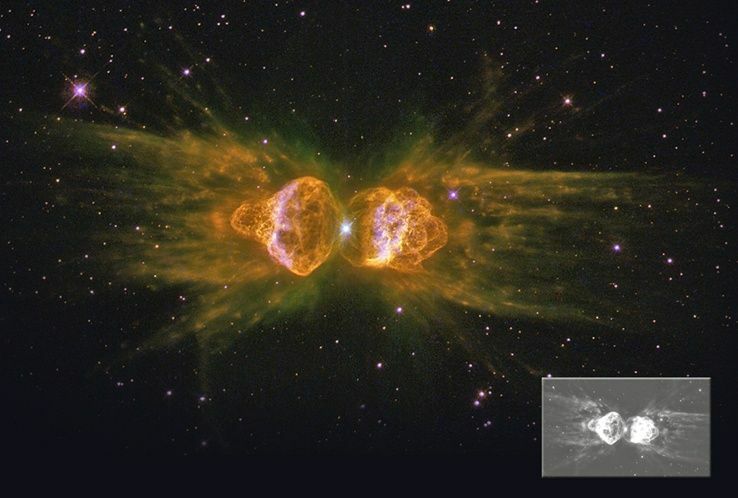 Menzel 3 is often referred to as the Ant Nebula because it resembles the head and thorax of a garden-variety ant. There's something sacred about it that poem. I have always loved it. The Ant Nebula / Menzel 3 - it is beautiful. Thanks for pointing it out. Apparently it can be seen from the southern hemisphere, which means... I can look at it.